Online nautical charts and topographic maps are available for free from MapTech’s Map Server. MapTech also sells digital and paper maps and charts. More info. Visit our Chesapeake Bay Maps and Charts page for maps and charts available for purchase. How to Read a Nautical Chart: A Complete Guide to the Symbols, Abbreviations, and Data Displayed on Nautical Charts. By Nigel Calder. In 2000, the U.S. government ceased publication of Chart No. 1 , the invaluable little book that generations of mariners have consulted to make sense of the complex system of signs, symbols, and graphic elements used in nautical charts. Now Chart No. 1 is not just reborn but expanded and improved in How to Read a Nautical Chart. Arranged and edited by Nigel Calder, one of today’s most respected boating authors, and containing four-color illustrations throughout, How to Read a Nautical Chart presents a number of original features that help readers make optimum use of the data found in Chart No. 1 , including a more intuitive format, crucial background information, international chart symbol equivalents, electronic chart symbology, and thorough explanations of the practical aspects of nautical chart reading. Click here for more information. These two books from the Williams & Heintz Map Corporation cover the Maryland the Virginia portions of the Chesapeake Bay. Each contains navigation charts created from the most up-to-date NOAA information. New editions are published every two years. They are large format books printed on wet-strength paper. The books come in a heavy vinyl sleeve with a velcro closure to protect them from spray when not in use. The maps contain information on buoys, water depth, tidal currents, marina and ramp locations, and channels. Each book contains an index to marinas, with locations, phone numbers, and amenities. The books also include tide charts, a planning chart, towboats list, and a distance table. There are several websites available that list Chesapeake Bay Loran and GPS waypoints for fishing and boating use. We’ve gathered links to these sites and have provided them below. Daybreak Local Fishing Information: Collection of GPS and Loran waypoints for Maryland’s lower Eastern Shore and Virginia’s Eastern Shore. Wrecks: Loran and GPS coordinates for Chesapeake Bay wrecks. Virginia’s Artificial Reef Program: Description and coordinates for artificial reefs. 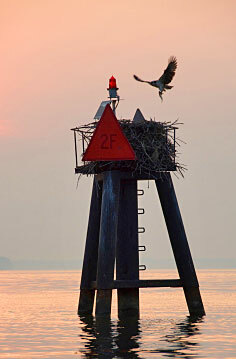 Aids to navigation include structures such as lights, radio beacon, buoys, and channel markers that provide mariners with navigational information. The United States Coast Guard publishes a “light list” which includes information on all aids to navigation. The light list includes for each aid to navigation: the light list number, name, bearing, geographic position, light or morse code characteristics, height, range, structural characteristics, and general comments. The light list index and database are available online here. “Red Right Returning” Red and green channel markers provide boaters with directions to get in and out of harbors. Green markers should be kept to your right as you leave the harbor, red markers should be on your right as you return to harbor. For more detailed information on channel markers and aids to navigation, visit BoatSafe.com’s chapter on aids to navigation.